Brumble's Forest at Meadowmere Park in Grandview is expected to be a unique destination playground in the guise of a magical forest (Seann McAnally). A state-of-the-art playground at Grandview’s Meadowmere Park should be complete by the end of October – some seven months behind schedule. Brumble’s Forest, a $1.2 million project that includes a new shelter house, restroom, parking lot and a “magical forest” playground unique to the KC Metro area, has been plagued with delays. Tony Finlay, director of parks and recreation, said the major issue has been Mother Nature. “The original completion date was May 20,” Finlay explained, “but the contractor lost 113 days due to weather. We had snow on the ground from January into March.” From May 20 until now, rain has robbed the contractor of 14 working days. All together, those delays add up to a 56 percent loss of construction time. The Board of Aldermen approved the park last year and awarded a $896,000 contract to Cobra Contractors, of Overland Park, who began work at the end of October 2010. The company has worked with the city before on public works projects. But delays due to weather created a “domino effect,” Finlay said. Cobra, like most contractors, had sub-contractors doing some of the work. Because of weather delays, Cobra wasn’t ready for some of the sub-contractors to get to work when they were originally scheduled. By the time Cobra was ready for them, many of those sub-contractors had other obligations and work had to be re-scheduled. “In some instances, one rain event can cost two or three more days before it’s dry enough to dig,” Finlay said. “A lot of the work that has been done is site work, including site grading/storm water management, water, electric and sewer lines,” Finlay said. “The city’s intent is to get it done as soon as possible,” Finlay said. “We’re trying to balance being fair to the contractor while getting the job done. We understand about weather delays. But there has to be a deadline.” The city’s contract allows for the assessment of liquidated damages, of $150 per day for each day the project is delayed. Notice has been given to the contractor of damages, with consideration of weather delays to be considered at the end of the project. Finlay pointed out that the city has been “more than fair” with the contractor, especially considering the fact that there were some days the contractor could have worked, but didn’t. “There were holidays and weekends where he could have worked. We did not exclude him from doing work in the park on holidays and weekends. He just chose not to,” Finlay said. Brumble’s Forest is designed to resemble a magical wooded area, complete with a tree house, forest features kids can climb and play on, and a future nature trail. 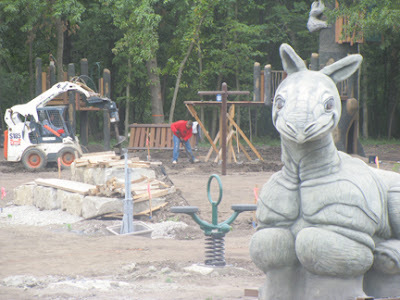 View photos of the construction process on the city’s web site www.grandview.org.